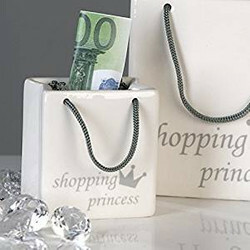 Casa Padrino offers you extraordinary saving boxes in abundance. Even the ancient Romans saved their wealth in certain containers. Since there were no banks at that time, the money had to be kept safe. Over the years, craft artists designed containers in the form of gold donkeys, ladybugs or bees, which were then associated with diligence and thrift. 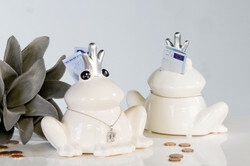 The piggy bank, which centuries ago was a symbol of fertility and luck, was not only popular in Germany in the 14th century, but even in ancient China. Owning a pig was incredibly valuable in China as well as in Europe, signaling prosperity. 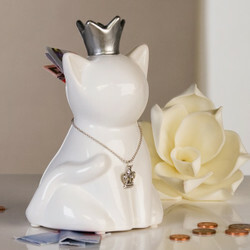 In addition to the classic piggy bank also very unusual money boxes are available. 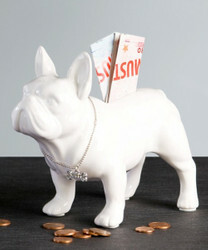 So the saved money can be stored in cute dogs money boxes or extravagant sculptures. 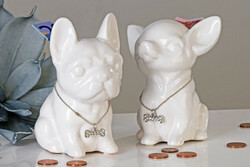 A great way to raise money for the wedding or honeymoon is to have a wedding money box. We at Casa Padrino also offer you an uncomplicated and Europe-wide delivery at reasonable and fair prices. Idealism and passion are very important at Casa Padrino. If you have questions or special requests regarding our offers, please call us on the hotline + 49-201-36577485 and our qualified support will help you in every detail! 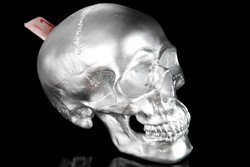 Casa Padrino, your baroque wholesaler on the internet and on site. Just magical.